Uyen and I went to Vietnam - on a food odyessy. We were food hunting, sampling everything we could lay our mits on! We had a day of markets: buying fruits - some crazy ones I had never come across, steamed coconut rice buns, varieties of different meats barbecued on sticks - causing the air to linger of lemongrass and sweet honey. The smoke raged our appetites and make our eyes open wide. We munched away, dissected, nibbled, sucked and generally investigated the offerings of the street stalls, drinking - sugar cane juice. 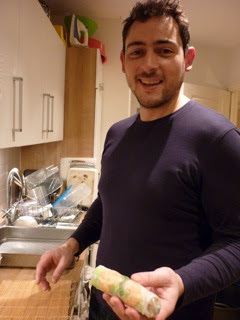 And then there, it was - the discovery of the summer rolls! Different from any that I had tasted in any Vietnamese restaurants in London. 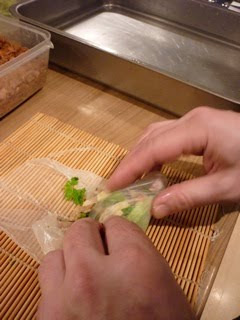 Vietnamese summer rolls vary greatly, most of the time the street bought ones are generally loosely wrapped with a small amount of pork and herbs and sometimes an extra rice paper to fill the roll. The ones we picked up this particular day, sold by a lovely woman, were nice in a couple of ways - they had crunchy bits inside them and lashings of fresh mint leaf, soooo refreshing! 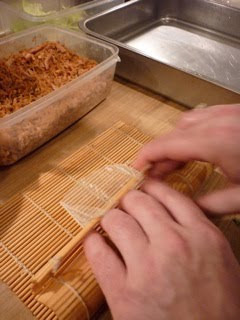 This experience has definitely become a huge influence in the creation of our own summer rolls that we regularly serve at supper clubs. 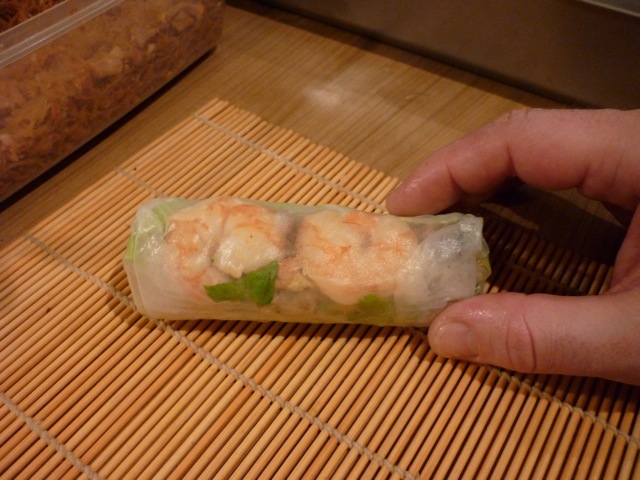 They are relatively easy to make and roll (with a little practice). It helps if you have a rolling mat, especially if you're making them as packed as we do!! 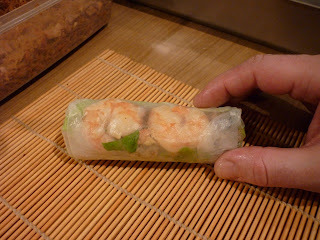 and for the added crunch factor, we also add in some of our chopped up woven spring rolls!! 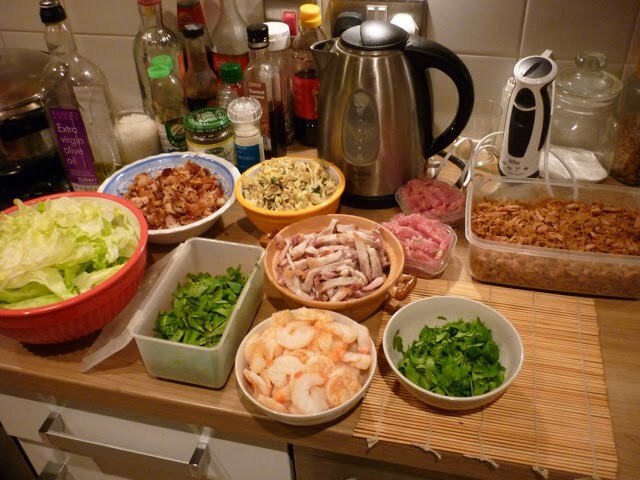 Here is the recipe for Spring Rolls. Time to roll these babies! And quite frankly getting all the ingredients together in one place is more work than rolling them!!!! 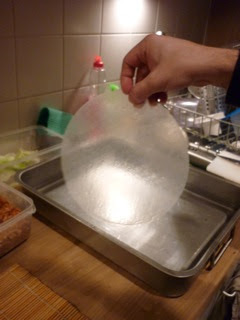 Dip rice paper in warm water, wet on both sides and drain of excess on side of tray. 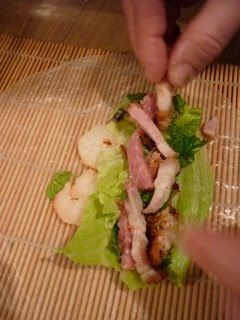 Lay it out flat on a rolling mat - if you're going for a more relaxed Vietnamese street style summer roll you really don't need a rolling mat - and do not delay in loading it with goodies! Fold the outside edges in so they are parallel, or point in very slightly to the centre at the top. Then fold the closest edge to you in to the centre. 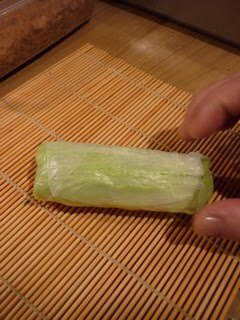 Pop the rolling mat over the top and roll away until sealed. Tip: If your rice paper is sticking to your mat and ruining everything! Soak your mat and rub it with vegetable oil to seal it. This happens when a mat is new. The Hairy Bikers - Wants You!